Symposium, 3-6pm, The Intercontinental afternoon tea, THE KOPPEL PROJECT, 93 Baker Street, London W1U 6RL, with guests Ginanne Brownell, Jan Kubik, Simon O’Sullivan, Agata Pyzik. 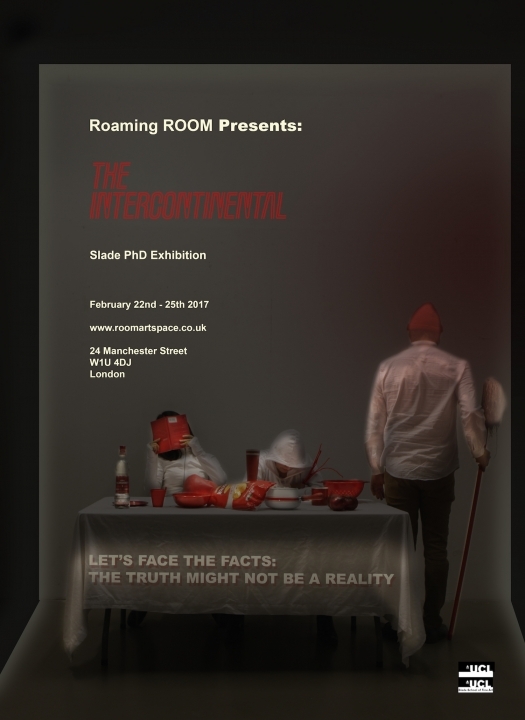 Exhibition preview, 6-8pm, Roaming ROOM, 24 Manchester Street, London W1U 4DJ. The Intercontinental exhibits new work by doctoral researchers from the Slade School of Fine Art. This event searches out the positions and shared concerns of artists working across different media as they reflect on the crisis of now within politics, academia, ecology and the media. The setting, a vacated house in central London, offers a context where notions of identity, home, art and the everyday are negotiated and revaluated against wider questions posed by recent political events and environmental contingencies.